Excedrin Extra Strength, 300 Caplets. Acetaminophen, Aspirin (NSAID) and Caffeine Tablets, Pain Reliever/Pain Reliever Aid. Acetaminophen 250 mg – Pain reliever. 300 Caplets. Aspirin 250 mg (NSAID ) – Pain reliever. Adults and children 12 years and over: Take 2 tablets every 6 hours; not more than 8 tablets in 24 hours. Children under 12 years: Ask a doctor. Starts to relieve migraine pain in 30 minutes. 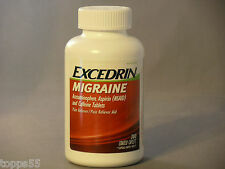 Excedrin Migraine Headache Coated Caplets. Excedrin Migraine 300 Caplets. 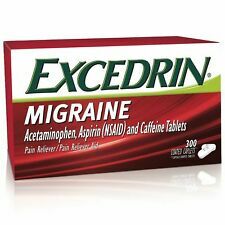 Excedrin Migraine contains acetaminophen, aspirin, and Therapeutically Active Caffeine. Active Ingredients: Acetaminophen 250 mg (Purpose: pain reliever), Aspirin 250 mg (Purpose: pain reliever), Caffeine 65 mg (Purpose: pain reliever aid). Adults and children 12 years and over: Take 2 tablets every 6 hours; not more than 8 tablets in 24 hours. Children under 12 years: Ask a doctor. We cannot be held responsible for delays caused by carriers. Trending at $21.87eBay determines this price through a machine learned model of the product's sale prices within the last 90 days. Adults and children 12 years and over: Take 2 tablets every 6 hours; not more than 8 tablets in 24 hours. Children under 12 years: Ask a doctor. Clinically proven to relieve headache pain better than Tylenol Extra Strength (Compare to Tylenol Extra Strength Caplets). A migraine headache is a recurring, throbbing pain that usually affects one side of the head, but may affect both sides. Migraine sufferers describe the pain ranging from mild to searing, excruciating, stabbing, and even debilitating. Trending at $20.87eBay determines this price through a machine learned model of the product's sale prices within the last 90 days. Use: Treats migraine. adults: take 2 caplets with a glass of water. do not take more than 2 caplets in 24 hours, unless directed by a doctor. Acetaminophen, Aspirin (NSAID) and Caffeine Tablets, Pain Reliever/Pain Reliever Aid. 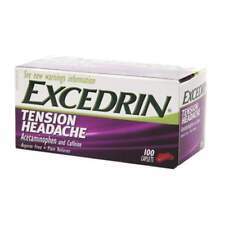 Excedrin PM Sleeping Aid for Headache Relief. Excedrin Extra Strength Pain Reliever Acetaminophen 125 Caplets 09/2019. Condition is New no box. Shipped with USPS First Class Package. See your doctor for diagnosis of migraines and migraine relief options. Excedrin Migraine for Migraine Relief. Select from a family of effective, over-the-counter pain relievers for a range of headache types. For different types of headaches, there’s an Excedrin product right for you. Excedrin Extra Strength has been a leader in headache pain relief for 50 years. Clinically proven to relieve headache pain better than Tylenol Extra Strength (compared to Tylenol Extra Strength caplets). Excedrin Extra Strength Pain Reliever Caplets. Excedrin Extra Strength 300ct Caplets. Excedrin Extra Strength contains acetaminophen, aspirin, and Therapeutically Active Caffeine. Active Ingredients: Acetaminophen 250 mg (Purpose: pain reliever), Aspirin 250 mg (Purpose: pain reliever), Caffeine 65 mg (Purpose: pain reliever aid). One 200ct Bottle of Excedrin Migraine Relief. 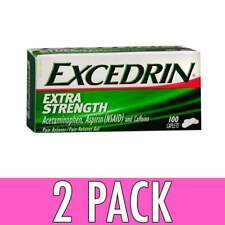 One 200ct Bottle of Excedrin Extra Strength. Exp 9/2021. Condition is New. Symphony Health Solutions. In addition, Excedrin Migraine relieves pain, nausea and sensitivity to light and sound with just 1 dose. Adults: Take 2 caplets with a glass of water. If your symptoms persist, or you’re under 18 years of age, ask a doctor. 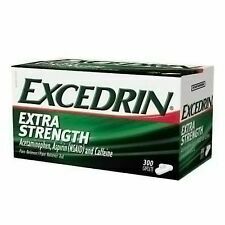 2 New factory sealed bottles of Excedrin extra strength 80 geltabs each box for 160 total!! Exp 11/2019 Fast and free shipping!! 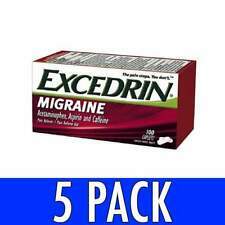 (4) Various Excedrin Pain Relief Each. 24 Ct Migraine Caplets Expires 01/2021. 24 Ct Tension Headache Caplets Expires 01/2021. 20 Ct Extra Strength Geltabs Expires 12/2019. EXCEDRIN CAPL EXT STR 200. Allergy alert: Aspirin may cause a severe allergic reaction which may include: hives, facial swelling, asthma (wheezing), shock. Liver warning: This product contains acetaminophen. Trending at $12.14eBay determines this price through a machine learned model of the product's sale prices within the last 90 days. Brand NEW!! 2 Pk 100 Excedrin MIGRAINE Extra Strength caplets Exp 4/21 . Condition is New. Shipped with USPS First Class Package. Excedrin Extra Strength is a combination pain reliever that contains acetaminophen, aspirin, and caffeine. We cannot be held responsible for delays caused by carriers. Preferred / Accepted. 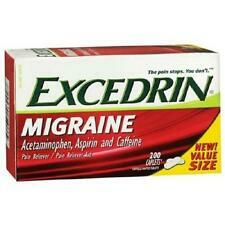 Excedrin Migraine Pain Reliever. For the temporary relief of mild to moderate pain associated with migraine headache. 100 Caplets. Expiration Date Always Fresh. Clinically proven to relieve headache pain better than Tylenol Extra Strength (Compared to Tylenol Extra Strength Caplets). A leader in headache pain relief for 50 years. (Active ingredients in each caplet: Acetaminophen 250 mg – Pain reliever, Aspirin 250 mg (NSAID ) – Pain reliever, and Caffeine 65 mg – Pain reliever aid. over 1 year shelf life). Excedrin Tablets contain Acetaminophen, Aspirin (NSAID) and Caffiene. We cannot be held responsible for delays caused by carriers. feminine care. Preferred / Accepted. One 100ct Bottle of Excedrin Migraine Relief. Fast. Trusted. Relief. The Excedrin brand has been a leader in headache pain relief for more than 50 years. Select from a family of effective, over-the-counter pain relievers for a range of headache types. Available in caplets and geltabs. Ingredients: . Adults and children 12 years and over: Take 2 tablets every 6 hours; not more than 8 tablets in 24 hours. Children under 12 years: Ask a doctor. Ingredients: Active Ingredients: In Each Caplet: Acetaminophen (250 mg), Aspirin (250 mg) (NSAID), Caffeine (65 mg).